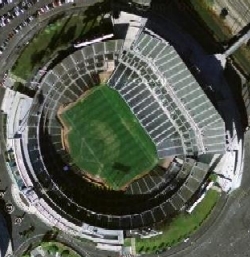 In an effort to try to lure Major League Baseball to the opposite side of San Francisco Bay, and in the realization that the AFL and its Oakland Raiders weren't going to wither away and die, the city of Oakland built Oakland-Alameda County Coliseum in 1966 on a 120 acre site, adding a basketball arena shortly thereafter. "The Coliseum" is unique in that it is partially built underground - fans entering the facility walk into the building above the lower-level seats. The Raiders were joined by the former Kansas City Athletics in 1968 as maverick team owner Charles O. Finley relocated his club. In 1982 the Raiders packed their bags and moved to Los Angeles, leaving the door wide open for Tad Taube and the USFL's Oakland Invaders to make it their home. In their inaugural USFL season the Invaders drew in excess of 30,000 fans a game, cheering them on to the league's first Pacific Division title. From there it would be downhill. Amidst a season-opening losing streak, attendance dropped to below 25,000 in 1984, and then to below 20,000 in 1985 despite a merger with the Michigan Panthers that propelled the Invaders into the USFL Championship Game. The demise of the Invaders would not prove to be the end for pro football in Oakland, for in an unprecedented move, the Raiders relocated back to Oakland after a dozen years in Los Angeles.